Jane Goodall has taught the world more about chimpanzees than anyone else in the world. Her dream to study our closest relatives began in 1960 in Gombe Park, Tanzania, and she continues her work to save them today. July 14, 1960…26 year old Jane Goodall arrives on the shores of Gombe Stream Game Reserve on the coast of what is now Tanzania. She had been sent by renowned anthropologist Dr. Louis Leakey - who then approached the National Geographic Society about supporting Jane’s work. She has no field experience or college degree. She also has the courage to spend months in a remote, even dangerous, place, getting closer to wild chimps than anyone before her. Within weeks she is making astonishing discoveries. Chimps will hunt down large mammals and eat them. And more shocking, they not only use tools, but make them as well. These discoveries - caught on film - sent National Geographic into a flurry of coverage. In the next 5 years, National Geographic presents Jane’s first film, and many articles in the magazine. She, and her beloved chimps David Greybeard, Flo, and Flint become known worldwide. And Jane redefines science, adding an emotional component. 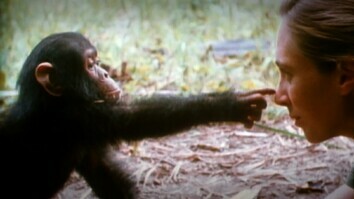 It’s what would drive Jane to learn as much about chimps as anyone in the world -- to find out how alike we really are. Goodall SOT: “During the early years, I thought how like people they were, but they seemed to be much gentler, much nicer. But then it became more and more apparent that chimpanzees like humans have a dark side to their nature. She witnesses a war between chimpanzees that lasts four years. Decades deep in her study, Jane discovers that the chimp populations are under threat from the outside. By the 1980s, they are an endangered species. Jane realizes she can best save these creatures by leaving Gombe...to speak to the world, face to face, about the importance of protecting these chimps. Gombe has since become a national reserve, and Jane’s sights are set on the future. And helping to mentor a new generation of chimp researchers. Fifty years later, Jane has witnessed the lives of three generations of chimpanzees. 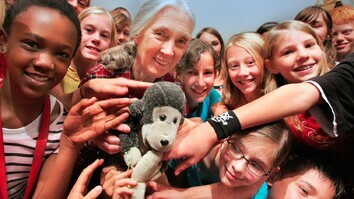 The dream that Jane Goodall set in motion lives on, and her partnership with National Geographic continues. The October (2010) issue of National Geographic Magazine features a celebration of the young English girl, who was a pioneer in so many ways… who patiently reached across every boundary to draw us closer to our closest relatives.